Office Concept, a publication for the commercial Architect and Design community in South-east Asia, wrote an editorial about Matteo Gerbi Limited and Ray Shelf. 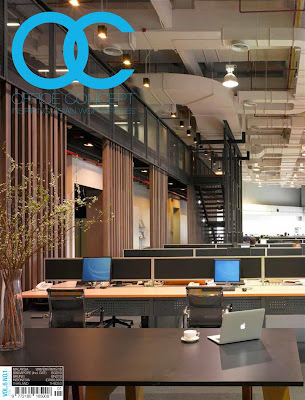 Modern businesses are increasingly recognizing the importance of the right furniture for their workspaces: not only do their choices project the company’s image and reflect its professionalism, but they can also have a bearing on the productivity and efficiency of its employees. It almost goes without saying that ʻfirst impressions countʼ, and this is certainly true of the appearance of an office in gaining client confidence. Presentation of a workspace will affect how a client perceives the business and credibility is undoubtedly heightened by a streamlined, uncluttered environment – after all, if a business takes a messy, disorganized approach to its own surrounds, what does that say about how it will approach a client’s brief? 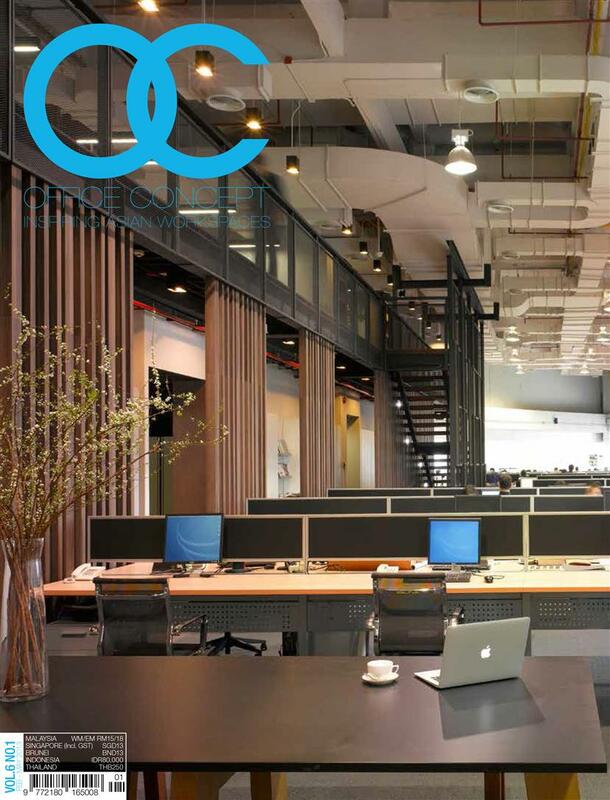 Productivity of employees is also a vital consideration in office design: every year, businesses lose large amounts of money due to ʻlostʼ working hours, caused by inefficiency and by physical and stress-related health issues. Including elements like ergonomic chairs, which optimize back health and help staff to sit comfortably at their desks, as well as spacious, durable work stations which hold all of the necessaries within easy reach, make work less stressful, more enjoyable, healthier and, ultimately, ensure better output. Over the course of the last decade, there’s been ample evidence that design shows and manufacturers are responding to the needs of business by increasing their focus on and investment in innovative, practical and stylish product design. The variety of materials and new technology now available to designers constantly opens doors to more vibrant options and ideas, however, frequently, ʻinnovationʼ is limited to applying these new methods and materials to already existing products. 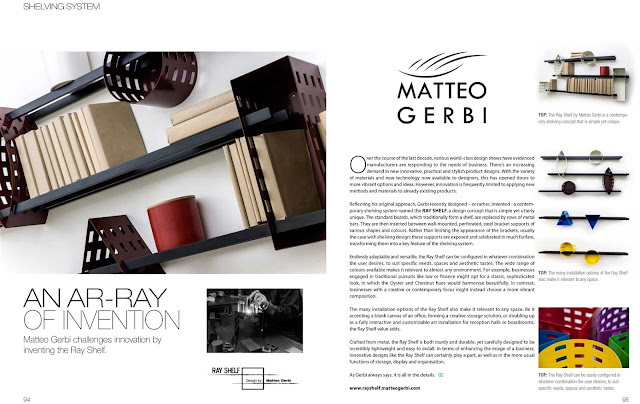 Matteo Gerbi has recently designed – or rather, invented - a contemporary shelving system named Ray Shelf, which absolutely reflects his original approach, with a design concept that is both beautifully simple and utterly unique. The standard boards, which traditionally form a shelf, are replaced by rows of metal bars, which are inserted between wall-mounted, perforated, steel bracket supports of various shapes and colours. Rather than limiting the appearance of the brackets, as is usually the case with shelving design, these supports are exposed and celebrated in the design, thus making them a feature of the shelving system. Endlessly adaptable and versatile, Ray Shelf can be configured in whatever combination the user desires, to suit specific needs, spaces and aesthetic tastes – and the wide range of colours in which itʼs available makes it relevant to any environment. Businesses engaged in traditional pursuits like law or finance might aim for a classic, sophisticated look, in which the Oyster and Chestnut hues would harmonise beautifully. Businesses with a creative or contemporary thrust might instead opt for the vibrancy of a brightly primary and secondary coloured composition. The myriad possible options for the installation of Ray Shelf also makes it relevant to any space, whether adding interest to the blank canvas of an office, forming a creative storage solution, or doubling as a fully interactive and customisable art installation for reception halls or boardrooms. Crafted from metal, Ray Shelf is both sturdy and durable, yet has also been carefully designed to be incredibly lightweight. Itʼs also very easy to install, with holes on the back panel allowing the user simply to screw the support to the wall. In terms of enhancing the image of a business, innovative designs like Ray Shelf can certainly play a part, as well as performing the more usual functions of storage, display and organization. Productive staff who enjoy their workspace and appreciative clients whose confidence is inspired by the credibility of your office: itʼs all in the detail.